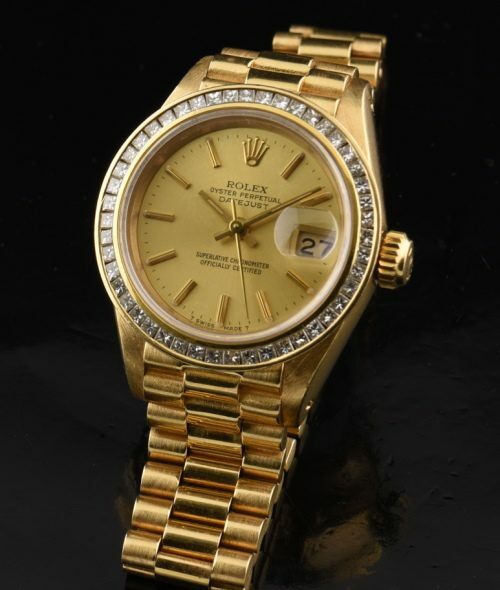 Home / Shop – Vintage Watches For Sale Used & Antique / Uncategorized / Rolex Ladies President 18k. This 1982 ROLEX PRESIDENT in solid 18k. gold-including the case and bracelet has a spectacular baguette diamond, glittering bezel. These diamonds are of top quality. This 26.5mm. solid gold ROLEX OYSTER case is scratch-less. The watch has a sapphire crystal. The 27 jewel automatic winding ROLEX movement was just cleaned and working perfectly. The champagne dial is original with raised gold baton markers. There is a quick-set feature for ease of date setting. The 18k. 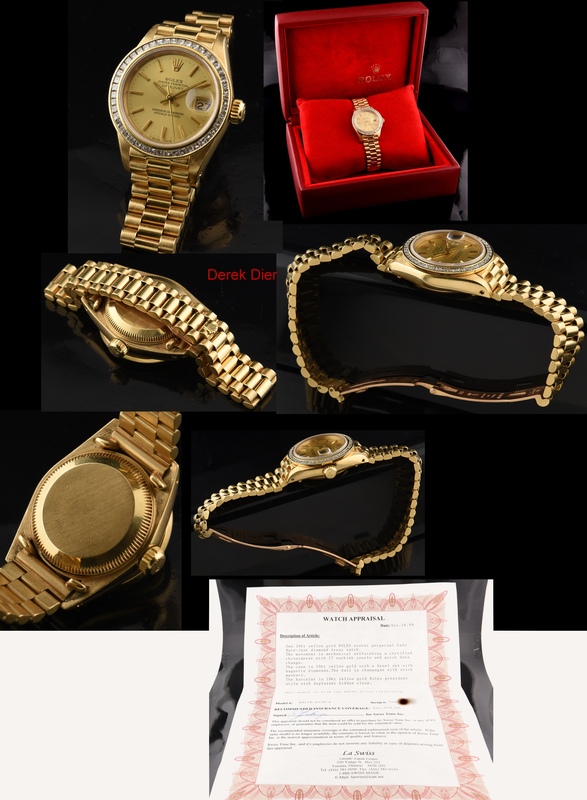 solid gold original President style ROLEX bracelet is not stretched out. The clasp is hidden. This watch will fit up to a 5.5 inch wrist. The ORIGINAL Rolex box is included along with an appraisal from La Swiss on Toronto valuing the watch at $54,050 replacement value. This watch is great value; and priced much lower than ebay for the same watch!